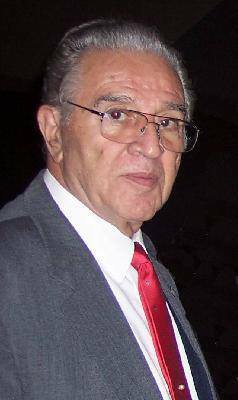 Harry C. Theofanus, past President of Cyprus Federation of America and a long time activist for freedom and human rights passed away in Florida, on January 24, 2015. Harry was born in Kyrenia, Cyprus. He immigrated to U.S. in 1946, educated in New York and enlisted in the USAF 1952-1955. He also served at the Air National Guard at Floyd Bennet Field. From the early days of 1949, Harry got involved with the Overseas Cypriot organizations and the Greek-American Soccer Team. He started getting involved with the Cyprus struggle for self determination from the British colonial rulers in the early 1950’s and has served proudly all Greek-Cypriot leaders during their official visits to United States especially in New York and Washington. During the Greek-Military Coup and the Turkish invasion of July and August of 1974, he participated in organizing peaceful demonstrations in Washington D.C. and outside the United Nations and Turkish Embassy in New York. Harry was elected and served as president of PSEKA (International Coordinating Committee for Justice to Cyprus) 1982-1986 and Cyprus Federation of America 1982-1985. Harry worked as service manager for Mergenthaler Linotype Company 1960-1989 then retired and moved to Florida. The family’s dream was to retire in Kyrenia, Cyprus but the Turkish illegal invasion and continuous occupation of 1974, the family’s home and properties were taken over by the Turkish Military and given to the Turkish-Cypriots and illegal Turks from Turkey. In Florida, Harry got involved with the local Greek and Cypriot organizations of the Tampa Bay Area, became an advocate for human Rights and kept following the Cyprus struggle for freedom very closely. He also joined actively NAMI (National Alliance for Mental Illness) to help people with brain disorders. Also member of St. Nicholas Church and Pancyprian Association of Florida. Harry is survived by his wife of 55 years, Yiota Theofanus; their two daughters, Fannie Theofanus and Christina and husband, Tommy Antoniou; four grandchildren, Harry Antoniou, Eleonora and husband, George Yiallouros, Victoria Antoniou, Ariana Antoniou; and great-granddaughter, Christina Yiallouros. Also by his two sisters, Mary and George Koudelis and Theano Giavis; uncle, Zenon and Georgia Post; cousins, nieces, and nephews in Florida, New York and Cyprus. In lieu of flowers, please make a donation in his memory to Vincent House, 4801 78th Ave. Pinellas Park, FL 33781. Harry’s passion was to see Cyprus FREE. During the past forty plus years that I have been involved with the struggle of the Cypriot people for Freedom and Justice, we had to bear the loss of friends and co-workers who died with the dream of returning to Kyrenia and seeing a free and united Cyprus. Today we lost a true champion of freedom and justice, my friend Harry Theofanus. A loving husband, a dedicated Father, Grandfather and Great Grandfather, he passed away yearning to see a free Cyprus. Besides his beautiful wife, Yiota and his family, Harry had two passions, Cyprus and Soccer. As a player with great speed and a deadly left foot, he distinguished himself with many teams including Greek American of New York and as a coach, referee and General Manager of the Pancyprian Championship team, he was able to promote sportsmanship and passion for the game. For Cyprus he was a close friend of Archbishop Makarios and his passion, commitment and dedication drove him to become President of the Cyprus Federation and PSEKA. Today our community mourns the loss of a champion, a USA veteran who served his country with distinction and honor. He would often write letters that always expressed his love for America and his bitter disappointment with our foreign policy that betrayed Cyprus by sacrificing American values and ideals for the sake of expediency. Please join me in conveying our deepest sympathy to his family and also in expressing our gratitude for his service and support. We salute his dedication, commitment and passion for Cyprus. We thank his wife, Yiota and the whole family for sharing Harry with our community. Today Harry joins the ranks of people like Dr. Savas Zavoyiannis, Dr. Christopher Christodoulou, Andy Athens, George Livanos, George Paraskevaides, Ted Spyropoulos and others who died with a dream for a free and united Cyprus. Today Harry joins the many Greek Cypriot refugees who died since 1974 with the dream of returning to their ancestral homes. There are no magic words that I can use to ease the pain and sorrow of his family but there is one thing Harry always knew – that we will continue this fight until Freedom and Justice comes to Cyprus.